Our AcuSyst bioreactors ensure sufficient yields will be met with each batch. The data to the left are from production runs in which the hybridoma cell lines were low-producers, and so longer run lengths were used to generate enough protein. Cell health and protein production was maintained consistently throughout the runs, and the quality of protein produced met all inclusion criteria, even after >60 days. To the left: C3’s bioreactors are able to maintain cell health and protein production for over 60 days. 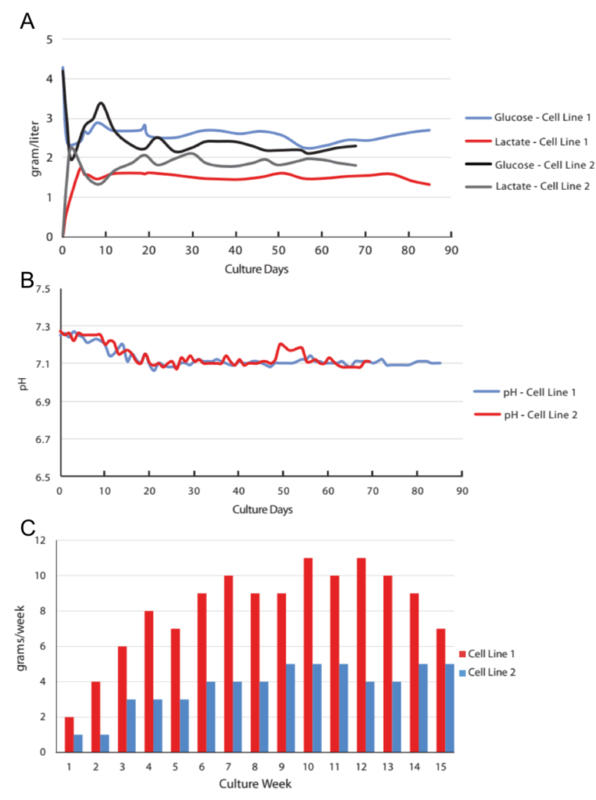 In A and B to the left, two hybridoma cell lines were grown in Acusyst bioreactors for >80 and 70 days (cell line 1 and 2, respectively), and maintained consistent metabolic parameters for the length of their runs. In C, two more hybridoma cell lines were grown for 15 weeks and IgG production was monitored throughout.